Zion Market Research has published a new report titled “Small Cell 5G Network Market by Radio Technology (Standalone and Non-Standalone), by Product (Femto Cell, Pico Cell, Micro Cell, Metro Cell, and Wi-Fi), by Component (Solutions and Services), and by End-User (Telecom Operators and Enterprises): Global Industry Perspective, Comprehensive Analysis, and Forecast, 2018–2025’’. 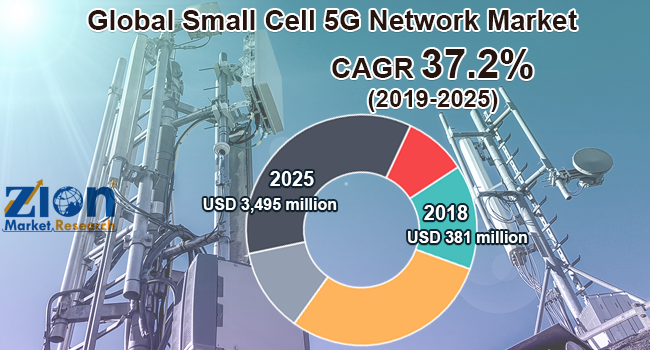 According to the report, the global small cell 5G network market was valued at around USD 381 million in 2018 and is expected to reach approximately USD 3,495 million by 2025, at a CAGR of slightly above 37.2% between 2019 and 2025. Small cells are termed as short-range and low-powered wireless transmission systems that are deployed for covering small geographical areas. However, these cells comprise all basic characteristics and functions offered by any traditional base station. Small cells are anticipated to play a crucial role in the 5G network, as they efficiently deliver high-speed mobile broadband and perform several other low latency applications. Mobile data traffic is basically internet content transferred to various mobile consumer electronics, such as tablets and smartphones. According to a recent survey, it is reported that worldwide mobile traffic is forecast to accelerate with a factor of 5, accounting 136EB per month by 2024. 5G networks are expected to carry nearly one-third of the mobile data traffic globally by 2024. Furthermore, it is projected that most of the cellular connectivity worldwide will be centered on 5G network technology by the end of 2024 With the rise in the number of mobile data traffics, the demand for technically advanced telecommunication network is at peak. By the deployment of the 5G network, the rising data usage will meet the efficient network quality required. Emerging network enhancement needs due to the global rise in mobile data traffic is likely to propel the market for small cell 5G network to a greater extent. However, the poor backhaul connectivity may hinder the overall growth of the small cell 5G network market globally. The worldwide commercialization of 5G technology is anticipated to create lucrative growth opportunities for the small cell 5G network market in the future. The global small cell 5G network market is segmented on the basis of radio technology, product, component, and end-user. The radio technology segment is classified into standalone and non-standalone. Due to the availability of advanced in-built capabilities, the non-standalone segment is projected to witness rapid growth over forecast timeframe. The product segment includes femto cell, pico cell, micro cell, metro cell, and WI-FI. The component segment is classified into solutions and services. By end-user, the small cell 5G network market includes telecom operators and enterprises. By region, due to the prominent presence of leading small cell 5G network market players and small cell solutions, North America is expected to dominate the small cell 5G network market in the future. The rising number of market relevant business activities, such as product launch, collaborations, partnerships, and mergers and acquisitions, are primarily contributing toward the small cell 5G network market in the European countries. Some key participants operating in the global small cell 5G network market include Baicells Technologies, ZTE, Ericsson, Huawei, Nokia, Contela, Comba Telecom, Airspan Networks, Samsung, Fujitsu, and Corning, among others.